By Azwan Jamaluddin in Internet. Updated on April 4, 2019 . While the majority of us dislike being served ads (prompting the making of apps that help you block ads) there are some ads that inform users of great deals, new services or tools that can be helpful to them. If ads are better catered to our preferences, we probably won’t find them as annoying or interruptive. Google serves ads based on preferences built upon your searches. Frequent searches of "computers" may cause Google to serve you more computer-related ads and deals. This however is not an exact science. If it helps, you can actually add or remove interests, essentially tailoring the type of ads you get served. Here’s how to pick your preferences. 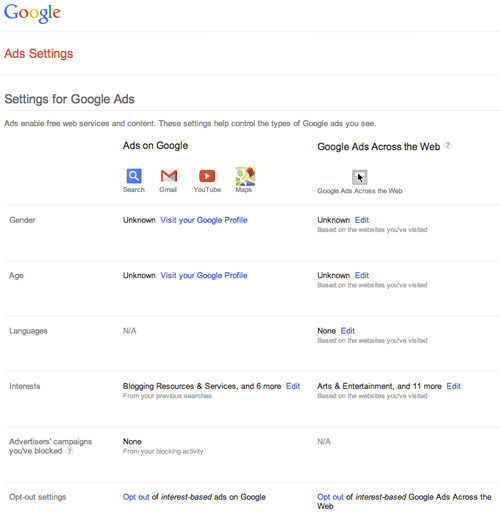 To access the information, you must first login to your Google account, and then go to the Google Ads Settings page. From here, you can see what information Google has on you based on your previous searches and the websites you’ve visited. Provided you haven’t given the data, Google can also make guesses on what age and gender you are using your history. In order to view the categories that are listed under your preferred ads, simply go to the Interests section and click on Edit. You can add and remove interests from this panel, suiting it to your taste. Once done, Google will look into the list and show advertisements that are more relevant to your selected interests. Here you can also choose to opt out of personalized ads. Note that the ads will still keep coming, however, they won’t be tied to your browsing history or searches. To do this, go to the Opt-out Settings > click Opt out. Note that this opt out applies only to the web browser and computer you are currently using. It must be redone if you would like this to take effect on another browser or computer. Google Ad Settings is a useful tool to make sure that all advertisements that are served to you are relevant and useful. It’s also useful if you feel uncomfortable with your browsing habits and history being used as a marketing platform. You may not be able to get rid of advertisements completely, but you can control what types appear.